I've spoken before about how I'm slow to adapt to new circumstances. Here's an example of that, as shown through the various desk arrangements I've used in my classroom over the last two years. I don't recall when room 1054 (now 128) essentially became "my" room. Previous to that I taught in various other rooms, as you do. One time in particular, I was sharing a room with another teacher who used tables - two students to a table. This threw me off a bit. I wasn't against it, I just didn't didn't understand why it was any better. I also remember creating two versions of each Grade 9 test at the time. At any rate, once I ended up in the same room for all 3 of my classes, I set it up in rows. As you do. That's obviously a recreation. 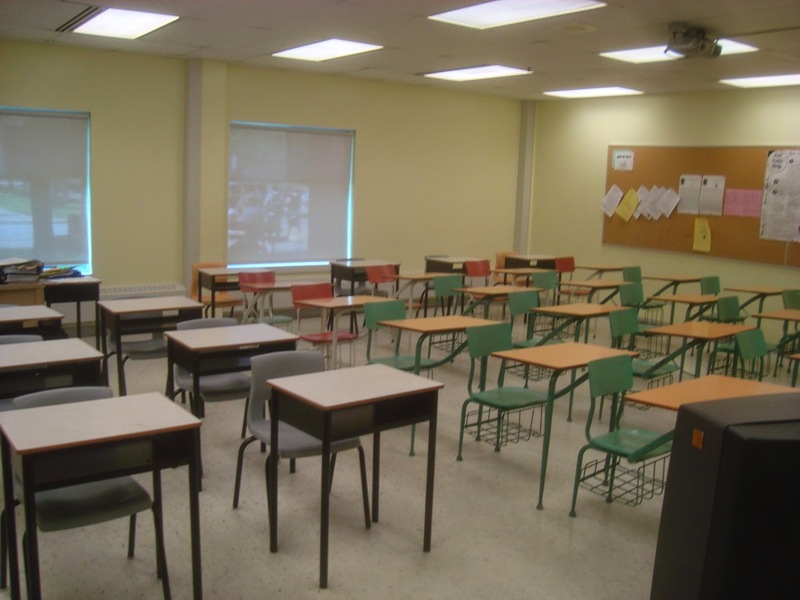 In particular, back then I had 23 of the "desks with attached chairs" and only 7 white "stand alone" desks. (The latter were placed around the perimeter. You'll notice a certain obsessive-compulsive behaviour around those different desks. Also regarding the red desks. 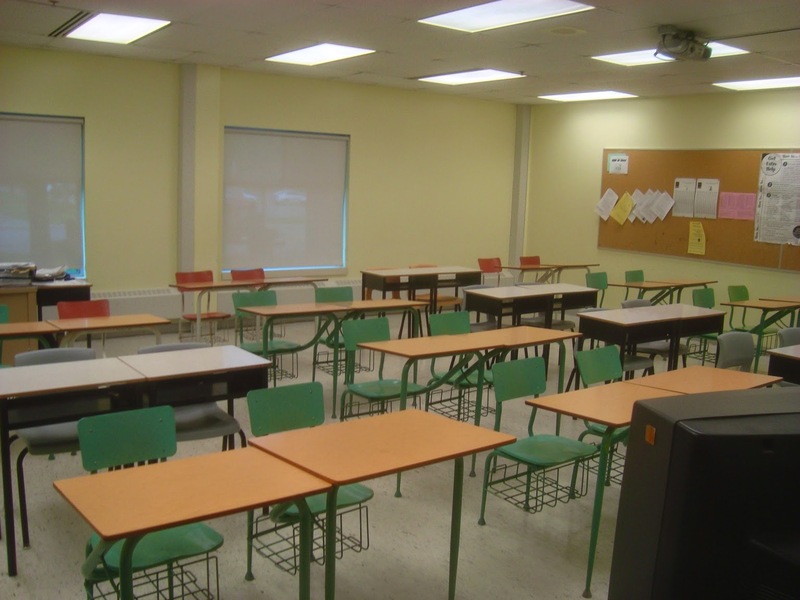 Also the desks with the bars on the left versus the right side. What I'm saying is, I'm a little OCD.) At any rate, moving on. Now, while I liked how that worked out, there were still problems. Which I included in my "bad things" roundup from November 2012. This is probably why I felt like, at the end of the school year, I felt that I needed to change it again. To start this most recent school year (when I ended up with more white desks), I decided to try threes. I hoped that interacting with more than one other person (namely two others) might encourage further interaction outside of that set. Ten groups of 3 wasn't practical for the space though, so I went with eight groups of 3 and three groups of 2. 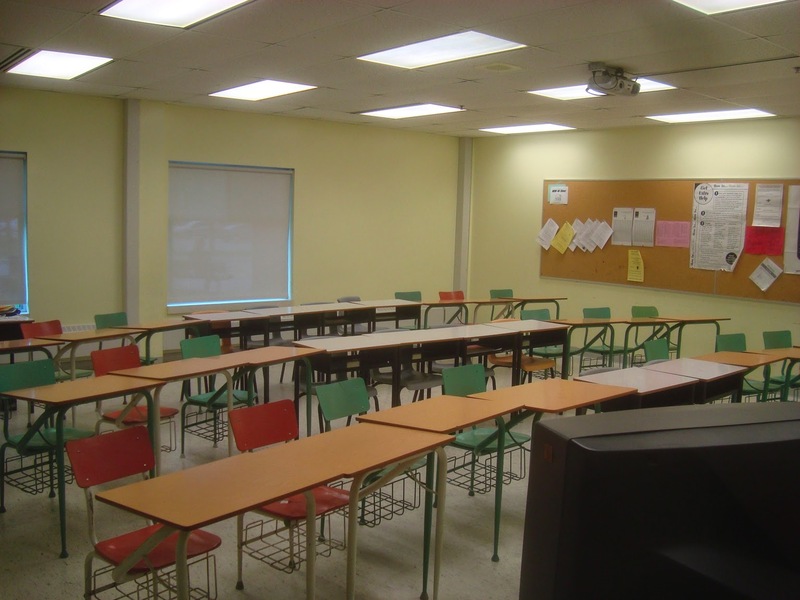 You'll notice there is still a defined "front" to the room (where the SmartBoard is located). Separating the desks for tests also became a touch more interesting - in theory, the person in the middle would stay, and the others would nudge out. But this made for a collision in the aisles, so in practice, the person on the aisle stayed, and the others nudged away. I feel like this worked the best of all the alternatives here, but (in my mind) the "groups" still became somehow entrenched. So when the new semester began in February 2014, I went "all in". This did not work out as intended. Instead of being encouraged to talk to people all around, the students stuck with talking to those they were immediately next to. Worse, I now allowed for larger "pockets" of people, in that six friends could all sit in an array and practically sequester themselves from the rest of the room. Which was always possible in the prior configurations, but with only three lines available here, this meant three individuals at the front became "isolated", as opposed to able to hook up with another group. But it did eat up time. 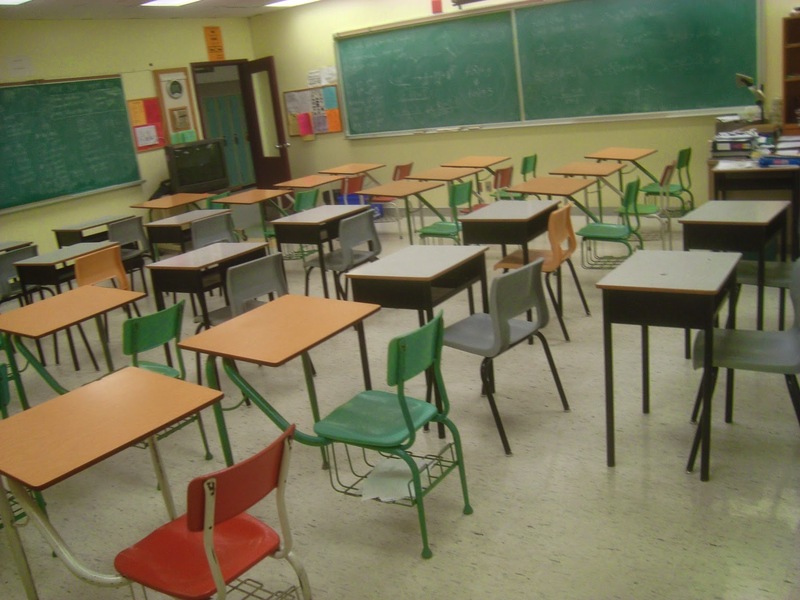 Also, any time the desks were different, students wondered if we were having an evaluation. (Slight side benefit: They did tend to sit in different desks on test days.) So I'm not going back to that. Which leads to a natural question. As I said earlier, the sets of 3 was probably the best. However, since not having a "front" to the room is becoming a thing, perhaps they can be configured out of rows? (Big leap for me here.) I'm almost willing to shoot for some random configuration, just to get more of a dialogue going. Other considerations: I'm still liable to have things on the main board. So how to accommodate those students who need to sit close? I'm open to suggestions. 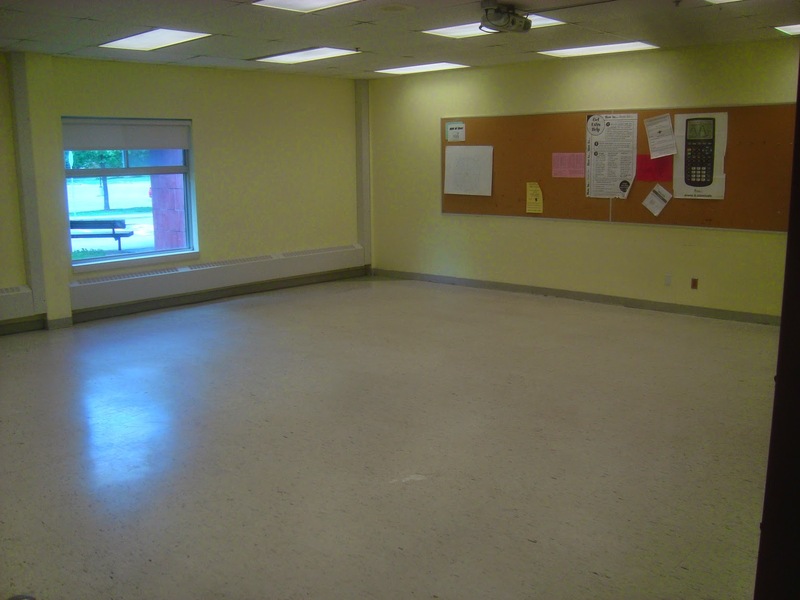 Bonus picture: What my classroom looks like partway into June exams, when the custodians need to wax the floor. This past year I had a mix of desks and tables. This allowed students who wanted (or needed) to work alone the ability to do so. 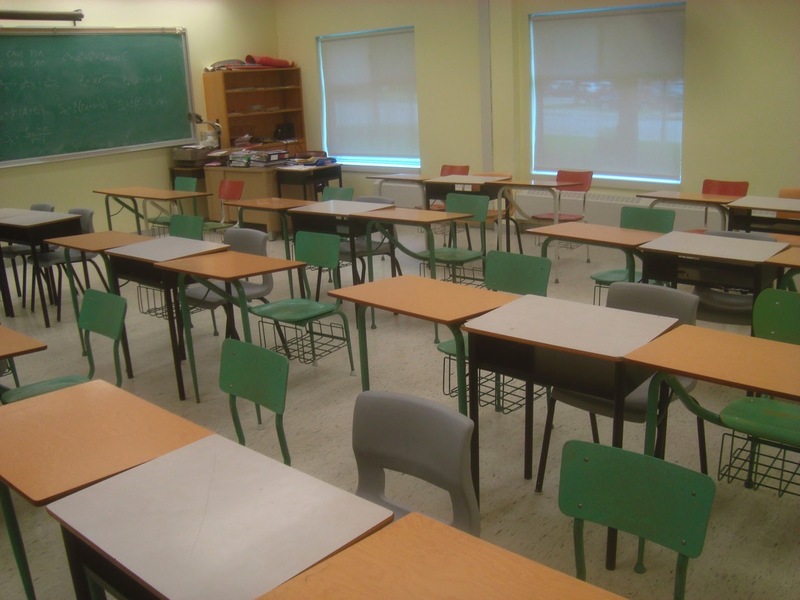 Students could work in groups as well at either tables or moving desks together. I could also make groups different sizes by having just tables and just desks or by adding desks to the tables for lager groups. I felt that with a mixture if both it was much easier to adjust for what I wanted that day and also freedom for students to choose which is best for them. That sounds nice and dynamic. Which sounds like it works for you. I fear it doesn't match my style at all... I'd much prefer to permute the students around, rather than the desks. That said, it's something I'll keep in mind, given the need for individual differentiation. This year (by 2nd semester) my setup was groups of 4 desks. 3 students per group (which leaves one desk for me to sit at when I come around to help during guided practice). The groups were spread around the room & turned in such a way that no person had their back to the whiteboard/screen but they might have to turn to the side to see it. I started the semester with assigned seating w/ students groups by mixed ability. Then I changed to assigned grouping by language (we have a large ESL population). Then I went to assigned grouping my ability (w/ like ability). By the end of the year I was doing the "visibly random group" thing every day. We also spent a lot of time out of our seats doing group activities on "vertical non-permanent surfaces". I've been debating having groups that are spread around, without anyone facing away from the screen. Also doing something with random groups. Not sure I'm at the "out of our seats" stage yet, but nice to hear that the prior setup elements are a possibility.